I’m generally not a video game person, but a few years ago a friend showed me how to “bowl” on his Nintendo Wii and I thought that was fun, so I decided to buy myself a used Wii on Craigslist (got a great deal too!). At the time I only had one TV, which was in my living room, and I decided I didn’t really want to set it the system up there. Note: I’m referring to the original Wii, not the Wii U.
I remembered that I had an old flat-screen computer monitor I used to use when I worked on a desktop computer, and figured I would just connect the Wii to that in my basement… Ha! It didn’t take long to realize that was going to be easier said than done. For one thing, Nintendo makes it clear they don’t think you should connect the Wii to a computer monitor and so their “Help” page about it isn’t very, um, helpful. Sorry, Nintendo… I remained undeterred! However I had both video and audio challenges before I finally came up with a solution that worked for me. Look… Isn’t it pretty? Well, let’s just pull back on this a bit, shall we…? Anyway, here’s how I put the system together. 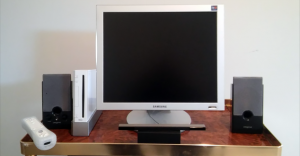 It’s very dependent on the various pieces of equipment I have, so if you’re trying to use a Wii with your own computer monitor, it may not work for you or you may be able to use just some parts of the solution. The Wii I bought came with a cable that has the standard composite output plugs (yellow, red, white), although you can buy component (red, green blue) and S-video (round with pins) cables for it as well. Unfortunately, my monitor, a Samsung Syncmaster 173P, only has a VGA and a DVI input. I couldn’t find any kind of adapter that would make me be able to use the DVI input, but I was able to get a variation of this RCA-to-VGA adapter to work (I can’t find the exact one online anymore). You connect the yellow plug from the Wii cable to the yellow jack on the adapter and use a VGA cable to connect the output port on the side on the adapter to the VGA input on the monitor. The adapter also has an S-video input, so if you have that cable for your Wii, you could use it as well. It also has VGA input so you can still connect a computer to the monitor without having to disconnect the Wii. Like a TV, the adapter has an Input button that makes it easy to switch between inputs. The adapter has more buttons, including ones to let you change the resolution and the color/contrast etc. to make the picture look as good as possible. When I started to write the post, I looked again to see if there were newer, easier options than this. I did find a new cable that is specifically marketed for connecting a Wii (or Playstation) to a computer monitor. I did get one, but at 480i resolution, the picture was extremely blurry and at 480p (the recommended resolution), my monitor said it was the wrong format so be aware of that possibility depending on your monitor. If you do decide to try using it, note that the picture and description says it comes with a male-to-male VGA adapter, but mine did not. However, you can buy one of these adapters pretty inexpensively. My monitor doesn’t have built-in speakers, which isn’t uncommon. But I did already have a separate set of Creative speakers I had used with my desktop computer—also not uncommon. What is uncommon about them is that the speakers do not have a port in them to attach an audio cable. Instead, they have their own hardwired cable with a 3.5mm plug to connect to the speaker jack in the computer. Of course, in this case the audio is coming out of the Wii, and it doesn’t have an Audio Out port. Its audio connectors are the other two plugs (red, white) on the Wii cable. Fortunately I found this audio adapter to connect the two and voila… Sound!!! NOTE: All in all, this solution includes 5 power cords: Wii, monitor, adapter, and speakers. So I definitely recommend a good power surge protector if you decide to do something similar yourself.